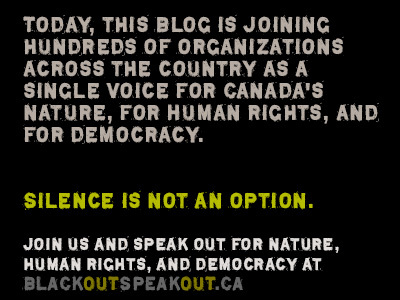 This blog supported the “Black Out Speak Out” campaign, along with many other organizations and individuals. That campaign fights back against the Conservative government’s outrageous budget “omnibus” bill C-38. From a climate policy perspective, the bill can be seen as part of the Conservative ongoing effort to 1) gut environmental assessments and scientific research; 2) attack ENGOs that disagree with government policy to promote unfettered development of the oil sands; and 3) to sideline and even eliminate inconvenient advisory bodies like the National Roundtable on Energy and the Environment.